Frank Colman Day 2019 will be held on Saturday, July 13, at Labatt Memorial Park. 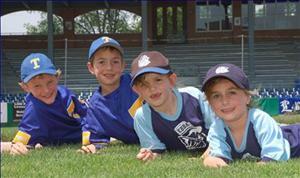 All T-Ball players will participate in skills stations and scrimmages. All other divisions will play All-Star Games showcasing the skills of EBBA players chosen by their teammates and fellow All-Stars from neighbouring leagues. If you ask eight-year-old Kale Bilger why he plays baseball, the answer is pretty simple. “I like baseball. I like sports. I like hitting the baseball, getting people out. In baseball you have a lot of fun,” Kale says. Daryl Landuyt, president of the Eager Beaver Baseball Association, is hoping kids from across the city will be able to share Kale’s enthusiasm for the game during this Saturday’s annual Frank Colman Day. The day, which honours a Londoner who played six years in the major leagues, involves baseball players ranging from ages 6-23 taking part in six games – rookie, mosquito, peewee, bantam, midget and junior – at historic Labatt Park. While Eager Beaver teams, as well as others, will be sending players to take part in the 25th anniversary edition of Frank Colman Day, Daryl is quick to point out the event shouldn’t be considered an all-star game. The day starts off at 10 a.m. with the rookie league game and then continues with another game about every two hours. While the day is open to the public and is free to kids who come out wearing their uniforms – and is just $2 otherwise – Daryl says the key to the festivities is letting the kids have fun. That fun, Daryl says, is only amplified by playing in one of the most historic baseball parks in the world. “Labatt Park is the oldest baseball park in the world,” Daryl says. “It’s a gorgeous ballpark. This park is baseball in London. And as the first minor sports organization in London, it’s appropriate for us to honour baseball here. And speaking of things Daryl hopes the kids won’t forget, that applies to the man who the day is named in honour of as well. The organization Frank Colman helped start has seen the interest in baseball come and go over the years. In 1999, Daryl says, there were about 900 players in the Eager Beaver association. Today, there are about 450. Still, Daryl says there are positives signs baseball continues to survive in London. If Kale plays baseball because he loves the game and has fun doing so, Daryl says he works with Eager Beavers to make sure kids such as Kale keep having fun with a game he personally has always loved. Another part of history will be honoured during Frank Colman Day as the Duchess of Kent Legion branch is going to be recognized for having sponsored Eager Beaver baseball each year since its beginning in 1955. Eager Beaver Baseball Assoc. will hold its 25th annual Frank Coleman Day baseball tournament this Saturday, July 12, 2008, 9 a.m. – 10 p.m., Labatt Park. Admission $2. Phone 519-433-8530. For more information about about Eager Beavers Baseball Association or Frank Colman Day, visit www.ebba.ca. Frank Lloyd Colman was born in London, March 2, 1918. Played first base for the Pittsburgh Pirates from 1942-46 and the outfield for the New York Yankees, 1946-47. First Major League appearance was on Sept. 12, 1942, and his final game in the big leagues was on Aug. 3, 1947. Was a non-roster player for the Yankees when they defeated the Brooklyn Dodgers in seven games for the 1947 World Series championship. Frank finished his six-year major league career with 571 at-bats, 15 home runs and 106 RBIs in 271 games for a career average of .228. Played in 1949 and 1950 in the Pacific Coast League with Seattle where he batted .319 with 18 HRs and 98 RBIs in 1949 and batted .310 in 1950. Returned to London in 1954 after serving as a player-coach with the Toronto Maple Leafs of the AAA International League from 1951 through 1953. Signed on as playing manager for London Majors’ owner and general manager Clare Van Horne in 1954. In 1955, Frank took over the Majors who won the Intercounty title in 1956. The team also won the Great Lakes championship in 1957. Returned the Majors to the Intercounty league in 1958. Co-founded the Eager Beaver Baseball Association (EBBA) with Gordon Berryhill in 1955. Frank died of cancer in 1983 at the age of 65. In 1999, he was inducted into the Canadian Baseball Hall of Fame. In 2005, he was inducted into the London Sports Hall of Fame. For those of you who may not be familiar with the origins of the EBBA, the following is a brief summary of our history. The league was formed in the spring of 1955 by a group of Londoners that included former major league players Gordon Berryhill, Frank Colman, and George ‘Mooney’ Gibson. The first season involved 300 players on 12 teams in the Peewee and Bantam divisions. To open the first season, the players paraded down Dundas Street to Labatt Park, where a number of exhibition games were held. As the league grew, Rookie, Mosquito (Tyke), Midget, and Junior Divisions were added. A competitive program was also introduced with all competitive teams known as the Tecumsehs, in recognition of the nineteenth-century London men’s professional team that won a number of international baseball titles. The league was officially incorporated in 1979. In 1983, the annual all-star game was named Frank Colman Day, in recognition of Frank Colman, one of the founders of the league, who had died that year. This event is held at Labatt Park, and is a highlight of the season for players in each division, because they have been selected to play by their peers. Players get to see their names printed in the official program and their names announced before they take their at-bat – just like the big leagues! The league operates as a member of the London District Baseball Association. We serve children and young people ages 7 to 21 living in east London. The league’s official boundaries are described later in this Handbook. Our competitive teams have had a very successful record over the years, at both the local level and at the Ontario Baseball Association’s annual provincial championships. Enjoy this year’s baseball season! He was JoeDiMaggio's teammate and Yogi Berra's friend, but ultimately, he became a quiet hometown hero to the kids in his hometown of London, Ontario. Although he was a Yankee and was a major-leaguer for six seasons, Frank Colman's name is not part of Yankee legend. But generations of London kids have Colman to thank for their baseball beginnings. Colman was inducted into the Canadian Baseball Hall of Fame on July 2, primarily for his contribution to kids' baseball in London. After his playing career, he returned to his hometown and founded the Eager Beaver Baseball Association, which has endured for the past 45 years and now has 850 players. Frank Colman died in 1983 at age 65. His son, Frank Colman Jr., accepted the hall of fame plaque at the ceremony in St. Mary's, with a large contingent of Colmans on hand. "If he were here, I think he would say his greatest accomplishment has been his contribution to the community through the work with the Eager Beaver Baseball Association." his son said. "That was his real pride and joy. He really loved that kind of work." Colman and Yogi Berra were teammates with the minor-league Newark Bears in 1946 and both were called up to the Yankees at the end of the season. In 1947, Colman opened the season as the starting right fielder but suffered a leg injury early in the year and underwent season-ending surgery. That would be his last season in the big leagues. He played for the Pirates from 1942 through part of 1946. His best season was 1944, when he hit .270 with six homers and 53 RBI in 99 games. His lifetime batting average was .228 in 271 games. In a letter to the hall of fame, Berra wrote that he visited Colman at his home in Canada on several occasions. "I've made a lot of friends in baseball through the years, but I'll always remember Frank as one of the most decent and genuine people that I ever met," Berra wrote. "I was proud that he was my friend." Colman played five years in the minors before retiring from pro ball. After he returned to London, he was owner and player-manager of the London Majors in the Intercounty League, then devoted much of his time and energy to building the Eager Beaver association.